MRCagney were the lead consultants working with Auckland Transport on the plan that developed the New Network: a revolutionary approach to planning an integrated network of frequent bus and train services that worked as a true network, rather than a collection of separate routes. At the time, one of the hardest things was communicating what the future public transport network would be like once it was finished. The problem with a revolutionary approach is that Aucklanders only knew the old network. A few people were quite comfortable with their regular bus route, and didn’t see the point in changing things. But most Aucklanders hadn’t used a bus in years, and didn’t see the point in having buses at all. As transport planners and engineers we were really excited about the future network we were developing. But regular folk had no idea how the New Network would work, how it would be used, and why we would want something different. Communicating just how much better the New Network would be was quite a task. We tried a few approaches to relate the New Network to what people understood already. The Link Bus was the premier bus service at the time. Unlike most bus routes it ran frequently all day, seven days a week, which people valued. You didn’t need a timetable and you didn’t need to wait very long, it was the prototype for the “just turn up and go” transit. So we said: “What if every bus was a Link Bus? What if all of Auckland was covered in a grid of Links, where you never wait very long and you don’t need a timetable?”. That got people engaged, or at least those that already caught buses. They could visualise the value of taking the best bus route in town and making the other buses just like it. But what about the folk who didn’t take the bus or train in Auckland, how would we engage them? We’ll we found out that a lot of Aucklanders had travelled overseas, and visiting places like London, Sydney and New York they’d used frequent trains and metro systems that worked on the grid model. So to them we said: “What if the buses in Auckland worked like The Tube in London? Where you just go to the stop and catch the next service that comes every few minutes, and because all the lines link to each other in a big grid, you can connect between lines to get anywhere across the city quickly”. That worked well, but there was a bit of confusion and a lot of explaining to do. 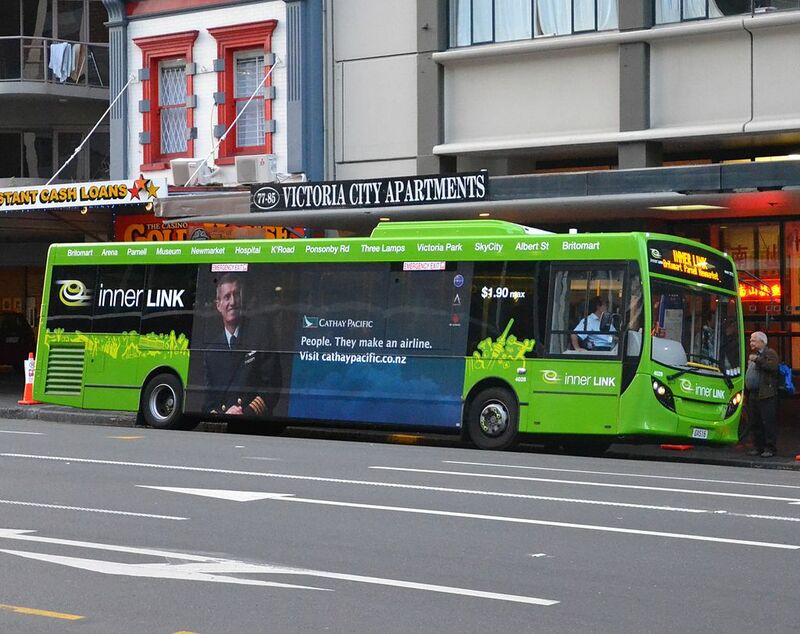 So we though, why tell people that Auckland’s buses would work like a metro system… why not just show them? That’s where the idea for the New Network schematic was born. 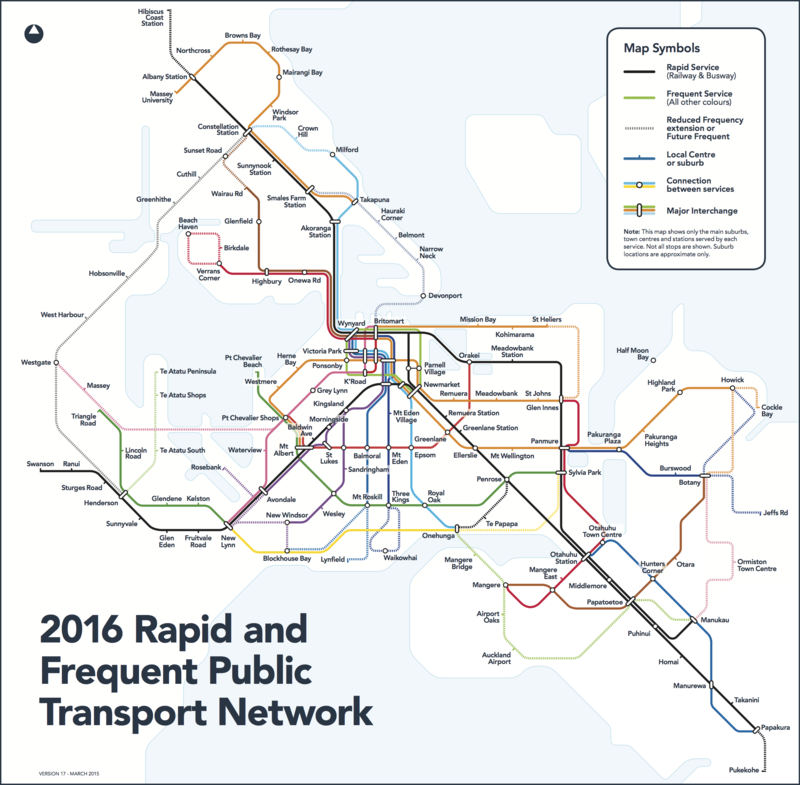 We shamelessly took the look and feel of famous London Underground map and applied it to the bus and train lines proposed for Auckland. The idea was, if the bus network was going to work like a metro system, and people would use it like a metro system, then let’s show it as a metro! Looking back, the first version of the map is a little clunky. It was our first attempt at network cartography and we had to learn the ins and outs of it overnight. A bit of polish from a design firm tidied it up for the public consultation. But nevertheless it did the trick, people could see the network at a glance, and see that what was proposed for the New Network looked just like all the proper transit systems they’d used abroad. At that point Aucklanders realised they could have proper transit too!